To treat keratosis your Manhattan dermatology doctor may prescribe a topical steroid cream like Cloderm or Locoid Lipocream. Another effective treatment for keratosis is the intermittent application of topical retinoids. If you are experiencing hyperpigmentation, it can be treated with a fading cream that contains hydroquinone (HQ), azelaic acid and kojic acid. If your skin discoloration is more extreme, consult your Manhattan dermatologist in NYC Dr. Susan Bard for specific treatments. If you’ve contracted a skin condition that seems like acne or small pimples, but doesn’t respond to the usual treatments, you may very well have keratosis pilaris. A visit to your New York City dermatology office can “clear things up” about the nature of your skin condition and how to treat it. Keratosis pilaris are rough bumps on your skin that some say look like the skin of a plucked chicken. If you do have keratosis pilaris, don’t be alarmed. It’s a very common skin condition that is made up of clumps of dead skin cells on the surface of your skin. These clumps or plugs usually appear on your upper arms and the front of your thighs. Children may develop this skin condition on their faces and cheeks. 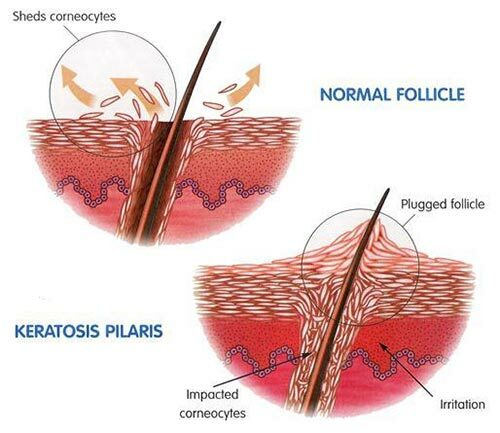 Your arms, thighs and other areas where you develop keratosis pilaris may become dry and itchy. If your skin is dry, the effects of keratosis are more noticeable. People who live in a dry climate find they only develop this skin condition in the winter when it’s drier. If you live in a warm, dry climate and swim throughout the year, you may experience this condition year round. If you spend a lot of time in direct sunlight, you may have a variation called solar keratosis. This condition, also known as actinic keratosis, appears as scaly, rough patches on your face and head. Older people are more at risk to experience this skin condition, which is harmless. However, there is a small risk that it can become skin cancer, so you should visit your New York dermatologist to receive a full examination and any recommended treatment. There is no known cure for keratosis pilaris. But don’t lose heart if you have it. In some cases, it goes away on its own. In others, its symptoms can be controlled and treated. Talk to your Manhattan dermatologist about the treatments that may work best for you. Fortunately, there are many skin care recipes and treatment options available to you. People get the condition for a variety of reasons. Plus, different people have different types of complexions. These and other factors prohibit a one-size-fits-all treatment. No therapy for keratosis pilaris is effective for everyone across the board. So you may have to try a number of treatments before you find some that work for you. One general treatment to prevent dry skin is using a mild cleanser that doesn’t contain soap, such as Cetaphil or Dove. Exfoliation is also helpful for getting rid of the small plugs of keratin in the top layers of your skin. The best results are typically found by combining therapies. You can see improvement by adhering to an ongoing skin care plan. Many people respond well to skin care programs designed to treat keratosis. Just remember that treatment has to be ongoing. If you don’t use the lotions or therapeutic creams as directed, the condition can return. In some cases, a complete clearing of keratosis isn’t possible even when diligently following the treatment plan. Your Manhattan dermatology doctor may prescribe a topical steroid cream like Cloderm or Locoid Lipocream. These are typically prescribed for seven to 10 days, applied one to two times daily to inflamed or red areas. Once the swelling is reduced successfully, you can treat the remaining rough, dry bumps with a mixture of urea cream and salicyclic acid. Another effective treatment for keratosis is the intermittent application of topical retinoids. These are stronger medicines that are applied weekly or biweekly. When your condition starts to clear, milder creams may be used as part of an ongoing regimen. If you are experiencing hyperpigmentation, which is an ongoing skin discoloration, you can treat it with a fading cream that contains hydroquinone (HQ), azelaic acid and kojic acid. If your skin discoloration is more extreme, consult your dermatologist in New York for specific treatments. You may need a stronger concentration of HQ — possibly six, eight or 10 percent. Be aware that a higher concentration of HQ can cause irritation and possibly even ochronosis, during which your skin may turn a bluish-black color. Topical immunomodulators are also effective at treating keratosis. These include creams with the active ingredient tacrolimus or pimecrolimus, which go by the brand names Protopic and Elidel. These treatments are typically used if you have severe inflammation or redness in the affected area. Your New York dermatologist may also suggest a two-step combination of a light source and topical photosensitizer for temporary treatment of keratosis. Light sources such as sunlight, red light, blue light and laser devices activate a chemical in the photosensitizer that temporarily treats keratosis. This type of photodynamic therapy can be useful for severe cases when you need relief quickly. Unfortunately, it doesn’t offer long-term treatment, but light therapy can be used in conjunction with other, more lasting treatments. If creams and other treatments aren’t effective in treating your keratosis, your dermatologist in Manhattan may recommend surgical treatments, such as a minor surgery called gentle acne extraction. This surgery is performed with a diabetic lancet to cut the skin. Then instruments are used to remove the trapped coiled hairs or keratin plugs formed below the skin, causing your keratosis. There are possible side effects related to surgery and the other treatments listed above for keratosis. The risks include skin tautness, redness, swelling, skin sensitivity and slight bruising. All these side effects are temporary and relatively minor. You can prevent your keratosis from becoming worse and possibly prevent it entirely by taking measures to prevent dry skin. Some of these measures include frequently applying emollients, as well as cleaning with mild soaps and cleansers that don’t contain soap. Do you have any questions about Keratosis Pilaris Treatment? Would you like to schedule an appointment with an internationally recognized, award winning, best rated dermatology specialist Dr. Susan Bard of Manhattan Dermatology? Please contact our Midtown or Upper East Side NYC clinic for consultation with cosmetic and laser dermatologist.